I am having fun pulling photographs into my kaleidoscope kreator 3 program. This one is garlic and barn from our harvest of 150 bulbs of organic garlic. I plan to print on fabric and make an embellished "art quilt" with this image as the center. Why am I drawn to kaleidoscopic designs? 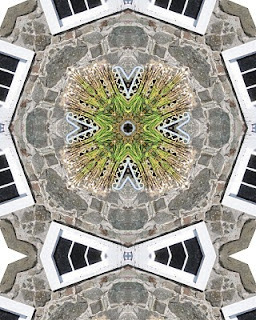 Mandalas and Kaleidoscopes--What is the Difference?